I did not own a business previously before Filta. Owning a Filta franchise for me, in particular, has been good because it allowed me to move my family back down to where I was from. I have three kids and now they’re able to be a part of my parents’ lives, my brothers’ and sisters’ lives, because I was living in Columbus. Me and my Dad joined forces to do the Filta franchise, so it’s brought our family closer together. We have a great service. People really find value in it and I feel like my territory is, I’ve just touched the tip of the iceberg, lot of room to grow there. The thing I probably enjoy most about it, about running my Filta business, is the opportunity that I get to have my hands in so many different areas, operations, accounting, dealing with the customers, stopping in on people that I’ve become friends with at my accounts, so the variety, I think, is what I really enjoy. There are several people that have called me and asked me for advice. It feels nice to be able to help them out, particularly in areas that I feel like I’m an expert in. 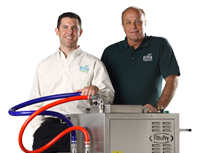 As an owner, I think some of the benefits of working with Filta is the knowledge, first of all, that a lot of their staff members have, and the direction that they give you. There’s also, when you’re talking to them on the phone, there’s a re-energizing and it allows me, at least as an individual, to get focused back into what I’m supposed to be doing as opposed to getting involved in the minutia of the operation and all the other things that you can get wrapped up in as an owner.